Veggie Lisa and I have teamed up again to bring you another delicious recipe! 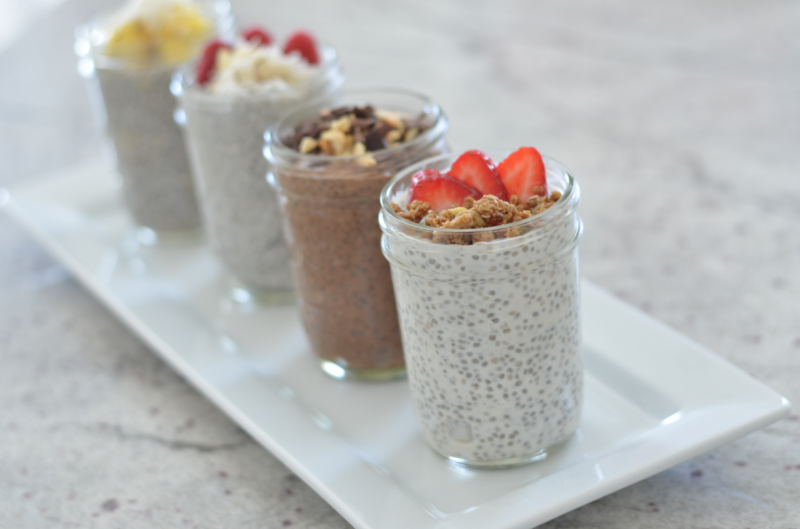 This one is really a four variations of delicious chia pudding recipes. Chia seeds seem to be all the rage right now for superfoods right now (actually, more like the past five years), and I’m FINALLY jumping onto the chia pudding bandwagon. Better late than never, right!? If you haven’t ever had or made chia pudding, it’s super easy and it tastes delicious. It’s also very versatile and can be eaten as a breakfast or even dessert. These beauties can be whipped up in minutes (even though they have to sit for a few hours before they’re ready to be eaten) but you’ll love them all. Honestly, I’m feel so lucky I have Veggie Lisa to share all of her amazing recipes with me. Allow to sit in fridge for at least 4 hours or overnight. Give the mixture another couple of stirs. Place in a jar or other small container for at least 4 hours or overnight. In small bowl, mix all ingredients together. Place in jar or small container and allow to set in fridge for 4 hours or overnight. What is your favorite way to enjoy chia seeds?